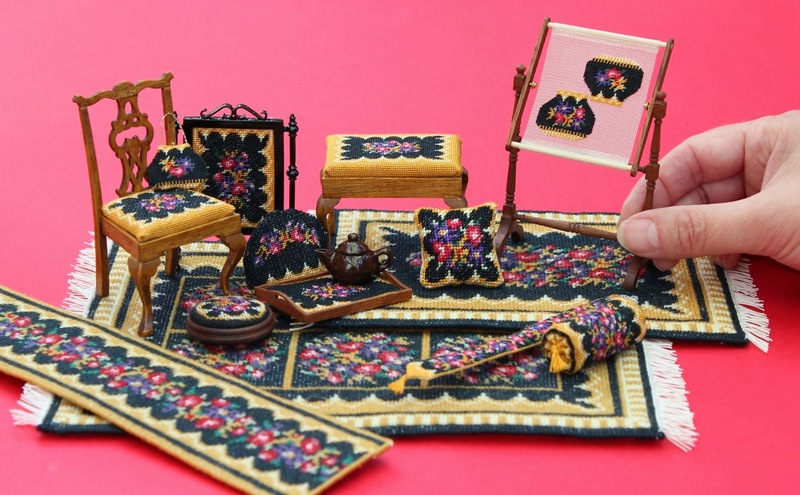 Do you own a Victorian style twelfth scale doll’s house? Then you will love the new kits from Janet Granger – a large collection of classic Berlin woolwork style carpets and matching accessories, all in a stunningly dramatic black and gold pattern, with a central panel of flowers in deep jewel tones. 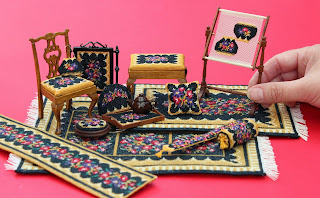 They are all to be stitched using tent stitch (like half cross stitch) – the fabric counts range from 18 canvas (for the carpets), to 32 silk gauze, and even 40 gauze for the teeny handbag. The carpet kits contain Appletons crewel wool, and all the other kits contain Anchor stranded cotton. The kits have clear instructions, and colour block charts to count the design from. All necessary components are included in the kits, such as the metal bellpull end, or the wooden chair pieces. www.janetgranger.co.uk/tutorials.htm and see how easy it is to create one of these! The kits start from £4.75. P&P is £1.75 per order if placed by post (cheques to Janet Granger); p&p online depends on the order total (but free over £40).